This article is about the Egyptian novelist. For the Egyptian doctor, see Naguib Pasha Mahfouz. 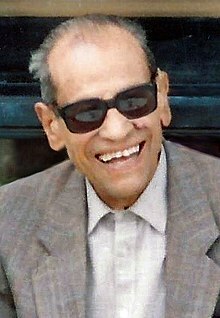 Naguib Mahfouz (December 11, 1911–August 30, 2006) was an Egyptian novelist who won the 1988 Nobel Prize in Literature. He managed to modernize Arabic literature. He is one of the few writers of Arabic literature who explored themes of existentialism. Naguib Mahfouz was born in the Gamaliya quarter of Cairo and was named after Professor Naguib Pasha Mahfouz (1882-1974), the renowned Coptic physician who delivered him. In his childhood Mahfouz read extensively. His mother often took him to museums and Egyptian history later became a major theme in many of his books. The Egyptian Revolution of 1919 had a strong effect on Mahfouz, although he was at the time only seven years old. From the window he often saw English soldiers firing at the demonstrators[source? ], men and women. "You could say," he later noted, "that the one thing which most shook the security of my childhood was the 1919 revolution." Before the Nobel Prize only a few of his novels had appeared in the West. Because of his outspoken support for Anwar el Sadat's treaty with Israel, his books were banned in many Arab countries until after he won the Nobel prize. Like many Egyptian writers and intellectuals, Mahfouz was on a "death list" by Islamic fundamentalists. He defended Salman Rushdie after the Iranian leader Ruhollah Khomeini condemned him to death, but later he criticized Rushdie's Satanic Verses as "insulting" to Islam. Before his death, Mahfouz was the oldest living Nobel Literature laureate and the third oldest of all time, only Bertrand Russell and Halldor Laxness were older. At the time of his death, he was the only Arabic-language writer to have won the Nobel Prize for Literature. ↑ NobelPrize.org, "Naguib Mahfouz"; retrieved 2012-9-18. ↑ Haim Gordon. "Naguib Mahfouz's Egypt: Existential Themes in His Writings". Retrieved 2007-04-26. This page was last changed on 31 October 2017, at 13:11.